Our loads over our shoulders are usually the main reason we cannot experience or enjoy our travel as we envision. Moreover, there’s one more highly necessary accessory that should be added to the list to carry for someone who does yoga. Definitely, it is ‘The Yoga Mat’! For a regular yogi, a Yoga Mat is something that should be carried with them wherever they go. Furthermore, heavy luggage is already a burden for most but for a traveling yogi and a heavy Yoga Mat makes it worse. In fact, it is usually one of the main reason why they don’t carry the Yoga Mat and eventually break the daily routine of morning yoga we have committed to do. Hence, to encourage the yogis even more and make their travel easier. Here is a list of Yoga Mats that are light-weight, especially for ones who Travel. Never travel without your yoga mat again. With Zura’s ultra-light Travel Yoga Mat, you can go anywhere with it. As most Yoga Mats are either light but too thin or thick but too heavy, this Yoga Mat is perfect due to its balance of light-weight along with the desired thickness. The mat is amazingly 1.4 lbs or 0.63 kg with a thickness of 5 mm. Which, as a result, doesn’t let nor your shoulders or your knees to have any strains. Also, the lightweight Yoga Mat is pleasant and functional, with reversible sides, pilates. Also, free of harmful PVC, phthalates, silicone, and latex and other toxic materials and made from 100% recyclable, biodegradable TPE material makes it an adorable for nature lover which most Yogis are. The super light and versatile mat is very comfortable for yoga from Jade Voyager. It is the most portable mat Jade offers, made specifically to go with you everywhere and anywhere. Jade Voyager has a simple basic design for the ones who want simplicity and don’t like much attention. As the name ‘Voyager’ suggests, it is designed especially for travelers. At the same time, it lacks no corners by having almost everything you want in a lightweight travel yoga mat – cool colors, incredible grip, and great comfort. They are made with a sustainable manner with natural rubber tapped from rubber trees, a renewable resource. Made in the United States, in compliance with all US environmental, labor and consumer protection laws Jade mat is an eco-friendly mat, that contains no PVC, EVA or other synthetic rubber. 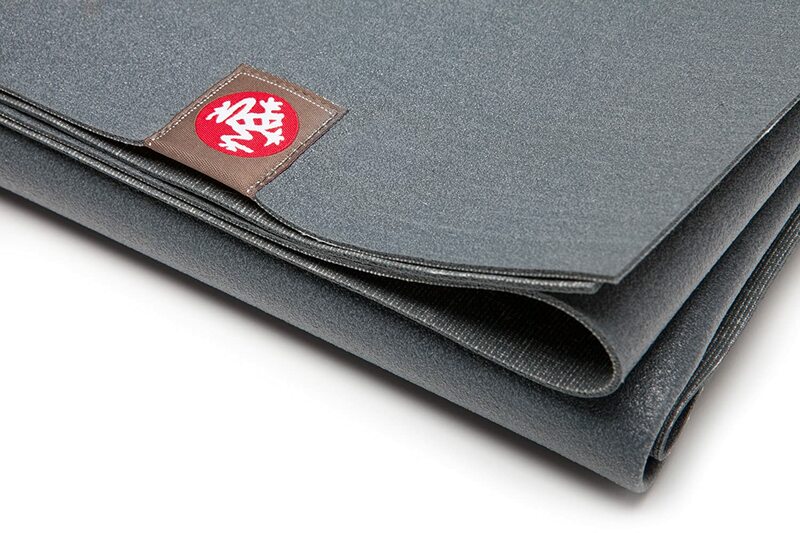 As per the name, eKO SuperLite Mat by Manduka is a lightweight yoga mat for travel that also provides excellent grip. The travel yoga mat is the best yoga mat for yogis on the go, wherever your practice needs you. Only 1.5 mm thick, it folds to fit easily in a bag, suitcase or even a purse. These eco-friendly yoga mats are made of a natural, biodegradable material. Along with being a light-weight yoga mat, it is also foldable and ultra-portable! At first glance, the YOGO looks more like a yoga towel to me than a yoga mat. Perhaps, in order to be more portable, that’s how a travel yoga mats should be. The extremely portable yoga mat takes up a pretty small amount space in your bag that includes a cute little strap with the buckle designed to work as a handle. Hence, the YOGO solves the problems of portability, convenience, and sustainability along with being simple, long-lasting and made from a high-quality and sustainable material. The lightweight yoga mat uses a minimalist folding design to bring convenience and cleanliness to your practice. Plus, the mat has a good amount of fiction-making it a good non-slippery as well. YogiOnTheGo by Clever Yoga is lightweight, folding mat provides great stability and traction which improves when wet. Unlike most, this Travel Yoga Mat is meant for intense or heated styles of yoga. Not letting your busy lifestyle get in the way of your zen time as practicing yoga daily gets harder when traveling. YogiOnTheGo offers the perfect blend of packability and sweat-wicking performance so you can stay centered, wherever you are. Clever Yoga products are created by yogis, for yogis and who tests every product sharing it with the world to ensure it can handle the wear and tear that comes from vigorous daily practice. Also, to keep it a good and clean regularly, they have made it Machine Washable too. Tunods Fitness is a versatile and luxurious mat that isn’t just intended for any yogis and meditators but is intentionally designed for people that are constantly on the go or who travel. Put this lightweight Yoga Mat in your bag, car, or desk drawer and take it out whenever you get a little time to practice Yoga. This product is so lightweight and compact, you don’t need to worry about it taking up space or being difficult to transport. Also, it is mentioned that you can throw it directly in the Washing Machine with the rest of your clothes and it will come out new. Plus, it also comes with a good looking Carry Bag. After noticing that the yoga gear out there is just not good enough, a group of yoga enthusiasts named FlöAthletika decided to take it upon themselves to create yoga accessories to meet their high standards. Along with towels, blocks and other accessories this exciting group also make quality Yoga Mats called FloAthletika Yoga Mats. This yoga mat feels different and more durable. It is has a desirable balance of light-weight and cushioning and is very easy to clean. Shantihi Yoga Mat is made for a travel-friendly purpose. It is easy to carry and store as it is thick and light in weight. Furthermore, this mat is quite good not just for being light-weighted but also having a thickness of 5mm to cushion your spine and joints. The mat is completely TPE and Eco-friendly, thus giving you the peace of mind that you are keeping the environment and yourself safe from the harmful chemicals. The Yoga Mat has a waterproof surface which repels sweat, germs, and dirt. It also keeps bacteria and sweaty smell away from your mat. As a result, you can just spray some water and wipe the mat clean. With every mat purchased, a free eBook “10 Best Restorative Yoga Poses to Relieve Stress” is emailed, which shows you 10 poses you can use to relax, restore, heal and relieve stress. Iuga Pro is a lightweight and durable mat with no flaking, stretching, or falling apart. The Yoga Mat has a subtle difference by having an optimal combination of cushioning and stability. It has the correct thickness to complete all the poses you want without letting your knees to have no ache nor letting you have balancing problems. However, the best part about this mat is, “no more slipping”! Moreover, unlike most natural rubber and PVC mats, this mat gives no rubbery smell while you take it out of the package. The manufacturer also claims that the antibacterial material naturally eliminates germs and bacteria to keep odors at bay so your mat stays as fresh as the day you bought it. Promising to provide quality and comfortable travel experience for Yogis, the YoFoMat by Khataland has been specially engineered for the job. For more ease, the foldable Yoga Mat comes with a transparent carry bag with a handle, making it something we can carry along anywhere like work, gym, business trips, yoga class or vacation. The long, thick and light-weight Yoga Mat is non-sticky, slip resistant and provides stability on any type of floor surface. Also, unlike existing rolling yoga mats, the folding lines on YoFoMat are designed so that the side facing the floor would not touch the side facing the body, thus ensuring easy cleaning and providing sanitary support to yoga practice.